Day/Night brings together two metaphysical novels that mirror each other and are meant to be read in tandem: two men, each confined to a room, one suddenly alert to his existence, the other desperate to escape into sleep. In Travels in the Scriptorium (2007), elderly Mr. Blank wakes in an unfamiliar cell, with no memory of who he is or how he got there. He must use the few objects he finds and the information imparted by the day's string of visitors to cobble together an idea of his identity. In Man in the Dark (2008), another old man, August Brill, suffering from insomnia, struggles to push away thoughts of painful personal losses by imagining what might have been. Who are we? What is real and not real? How does the political intersect with the personal? After great loss, why are some of us unable to go on? 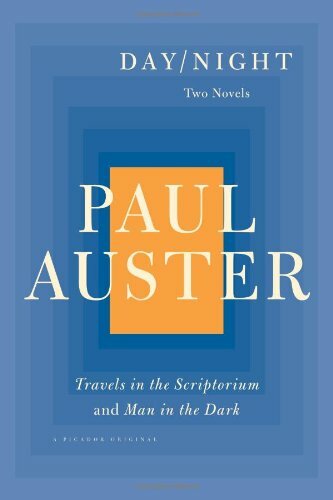 "One of America's greats"* and "a descendant of Kafka and Borges,"** Auster explores in these two small masterpieces some of our most pressing philosophical concerns.